Sandwiched between two sunny 50º days, it snowed and snowed in Austin yesterday and was a happy and unexpected surprise. Gadora met it with mixed emotions. Receiving both wildly good news and very sad news—both in the same day—I charged yesterday embracing endings, ready for new beginnings. Whew! Early on I finished a few watercolors and nestled in the living room for a brief respite. Dragging out a package of felting supplies and roving that a knitting-fiend, errr friend gave me over the weekend, Gadora wanted to take a stab at felting and see how quickly something good would come. Next, Gadora gathered some roving (which at that point looked a lot like cotton candy) and wrapped it around the soon-to-be birdie groin. Brookelynn suggested working the roving into a desired generic shape. Sitting the bird legs on the foam padding, I got to stabbing. With a medium-gage needle (38-star is the most commonly used), Gadora pricked Sr. Pajaro’s belly and rotated him evenly while doing so. Almost immediately his belly was formed into a nice, tight ball. 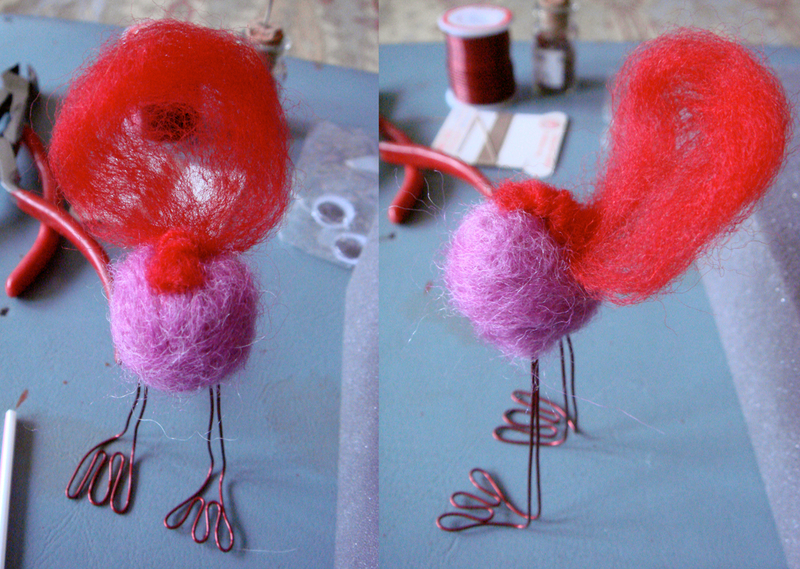 Once his belly was tight and robust, I pulled another strand of roving from the colorful pile and wound the bright red into an oval shape, twisting one end to adhere to Pajaro’s mid-section. Then stabbed him again. Lots! Gadora repeated the process for his head: pulled some roving, balled it up with my hands (think Play-doh), lightly pricked it to form a tighter ball, held it on top of Sr. Pajaro’s body, then stabbed through the ball’s base as I rotated his body. Within a few minutes, he had un cabeza, and it was connected. When working roving into a beak, it was easiest to do so by securing Pajaro to the foam board. His wispy wings were made from pulling a bit of roving, leaving it long, and pricking it onto his center-back with the medium-gage needle. With his beady eyes sewn on, it was only appropriate to give Sr. Pajaro a tiny tux shirt, he’s a boy bird after all and male birds are more dapper in nature. Pulled from a vintage jar of buttons gifted by the same friend, (Good stuff, right!) Gadora sewed it into place, making teensy tucks on either side of his belly, slightly forming wings. And Sr. Pajaro from the front. He is so stinking cute. 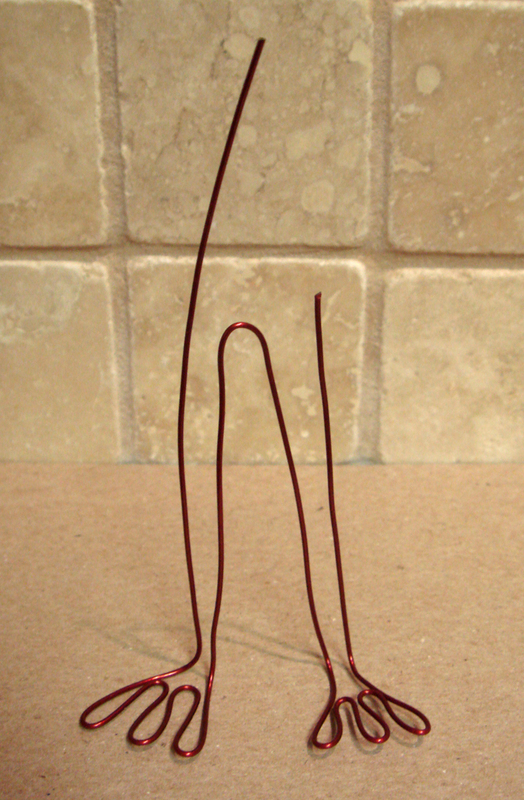 He stands tall (which Gadora will too today), with his antenna-like purple wings taking direction from the wind. Not my original intention, his red tail feathers act as his super-hero cape. And today, sun shining, the birds in Austin are rejuvenated and vocal. Yesterday’s fluke storm yields happy singing birds outside my window. Supplies: Colorful roving (or pet fur, people! 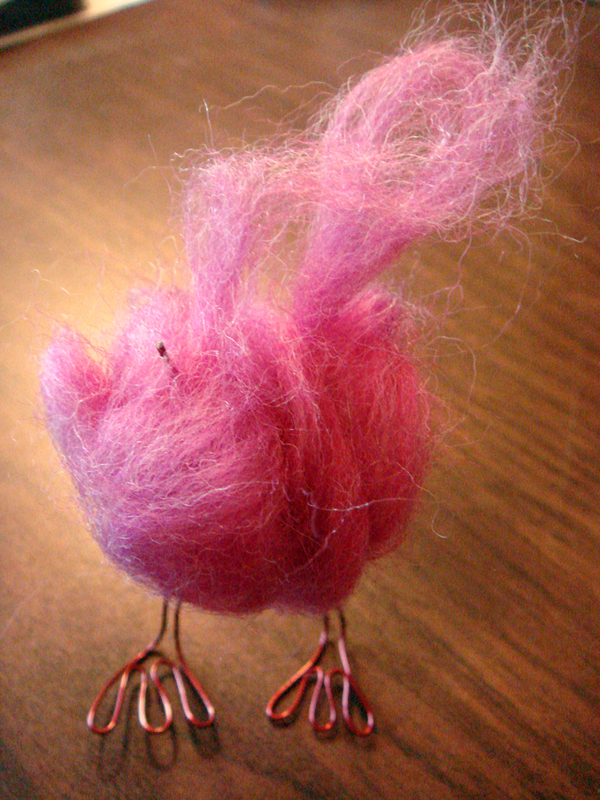 ), felting needles, foam work pad, buttons, string, needle, copper wire, and anything else you’d like your creature to don. How To (an edited excerpt from HoughtonAvenue): 1) Place a block of foam on your table. 2) Take a handful of roving, or other fiber, of your choice in one hand. 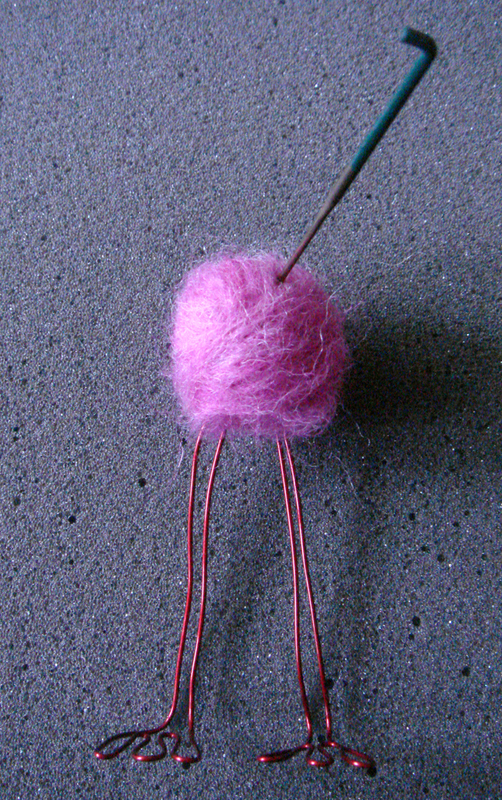 3) Begin stabbing the bundle of fiber—not your hand!—with your felting needle held in your other hand, turning as you go (unless you’re making a flat item). The more you stab the firmer the item becomes. Viola! To fit two pieces together, stab lightly at the area of connection until the two pieces are fastened together. Time it takes: Sr. Pajaro took all of an hour. 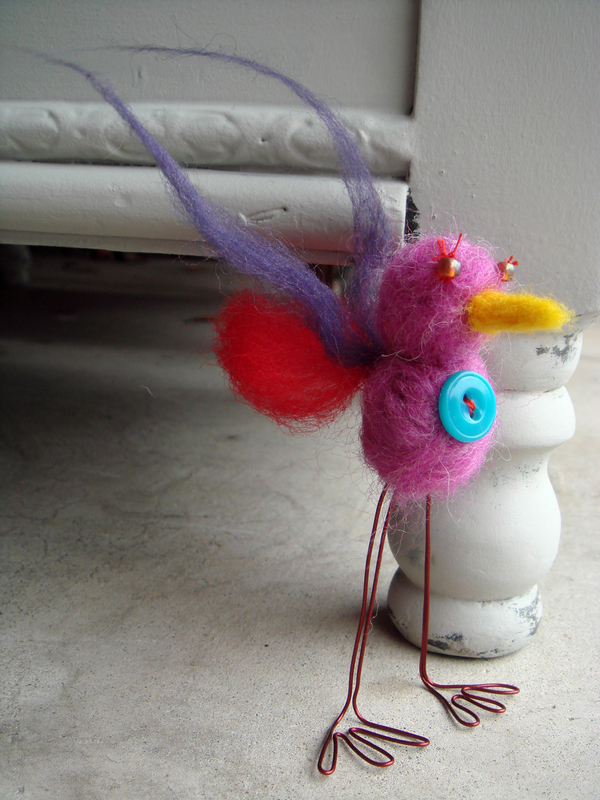 Chushka.com ~ TIPS on making felted animals. Chushka’s GALLERY of ANIMALS is amazing! 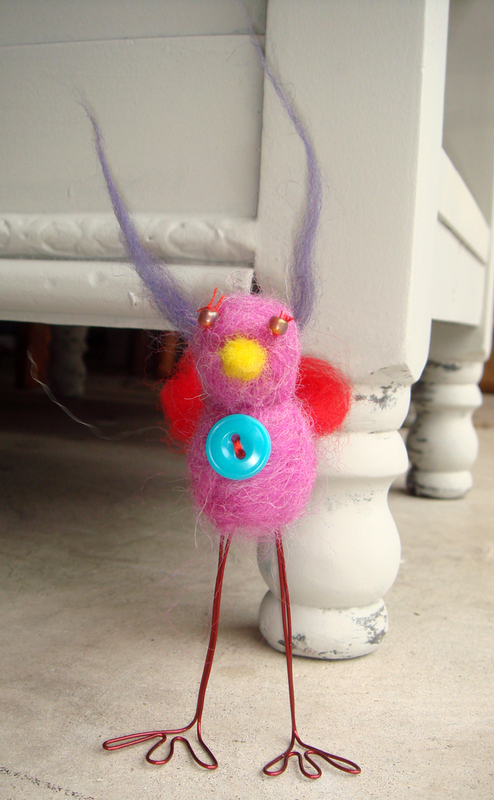 Cocoakoala’s Flickr ~ Needle felted creatures… cute! 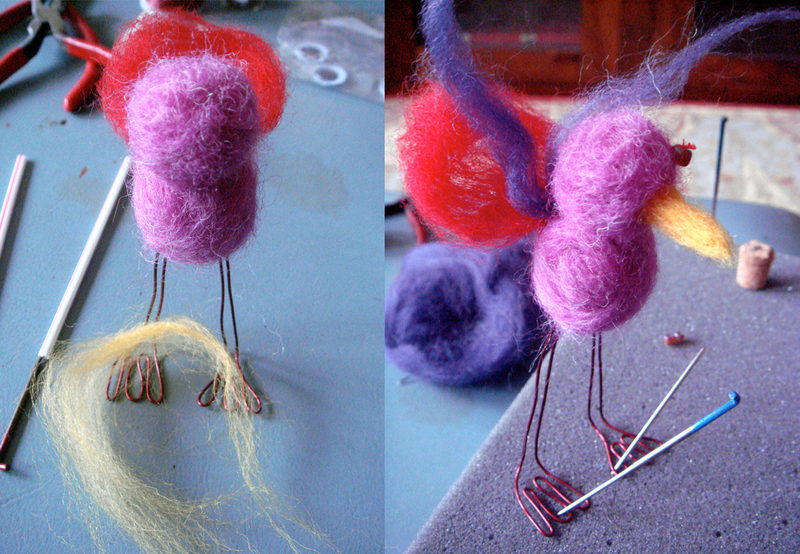 Posted on February 24, 2010 March 6, 2010 by gadorawilderPosted in Do-it-Yourself, Los Pajaros...Tagged Do-it-Yourself, easy art project, felt pet fur, felted bird, homemade craft, How to, inexpensive project. Next Next post: Q & A ~ Unique bedding under $150?